Marketing Week has revealed that The Sun newspaper is planning to dip its toe in the water of the alcohol drinks business with the launch of two beers - a real ale with "The Sun" brand name, and a lager with the "Page 3" brand name. Scottish readers won't find this as strange as other reader may, though. I remember the Tennant's Lager Lovelies from my youth. For a young Scot's lad, finding an empty can of Tennant's was the pre-pubescent equivalent of finding a dirty mag under a bush. The idea of printing images of scantily-clad women on beer cans came about as a clever advertising ploy in 1959, with images of Scotland being printed on the can to re-enforce the brand's heritage. Five years and 80 pictures later, the idea was wearing thin and so a series of "Housewives' Choice" cans were produced featuring attractive women and beer-related recipes. One of the women, Ann, became a "Forces pin up" and demand led to Ann having a series of her own. The novelty then developed and the "Lager Lovelies" followed. Thanks to Neil Lawrence's website for the history and images. The irony is, we've just delivered a programme to the DFES aimed at encouraging kids to do STEM subjects (Science, Technology, Engineering and Mathematics) at school. Toshiba have purchased a 30-second $2.7 million Superbowl advertising slot in a last ditch effort to support the flailing HD-DVD format - having obviously noticed that *no-one* is buying their decks or discs. I reckon that the very act of doing this magnifies their desperation. In Peter Chippendale's excellent book "Dished: The Rise and Fall of BSB", he reported that BSB's CEO Anthony Simmonds-Gooding said that on the brink of bankruptcy (prior to the merger with Sky) they had spent so much money marketing the enterprise it would have been cheaper to have just given the Squarials away (and thus built up a large and appreciative audience). If Toshiba are at the stage of desperately throwing money about, have they not considered building up a user-base by giving away their players for free, like Xerox do with printers? I'd have a free one thanks! The software business realised years ago how to establish a market by initially giving their product away (eg RealPlayer and Macromedia Flash). That $2.7 million could have been used to give away 21,428 $126 Tosh decks to anyone who bought an HD-DVD film from Amazon/HMV/Walmart/whoever - all who would have done the marketing of the great giveaway offer at no cost to Toshiba. I thought that one of the biggest jaw-drop moments of the 15 Jan Macworld was a comment by Jim Gianopulos, Chairman & CEO of 20th Century Fox. Watch this clip and not only hear Jim declare Blu-ray the winner, listen to the non-partizan audience laugh in mocking agreement. Very telling. So Hasbro is using it's big-gun lawyers to pull Scrabulous off Facebook. Nice move Hasbro. Scrabble, a dying, minority boardgame played by old people has been given an amazing and new lease of life on the hottest social network site out there, played by around 600,000 people (and the App subscribed to by just short of 2.4 million people). So shutting it down would be a good move then?! Didn't Hasbro think of buying the property and re-naming it Online Scrabble? Or, doing some kind of licencing deal? It would have been worth just giving them the license for free. Didn't they see the marketing opportunities, keeping the game alive. At the very least Scrabulous users could have been offering discounts off the boardgame? As one Scrabulous fan wrote on the "Save Scrabulous" Facebook page "I didn't have any Scrabble sets when I started playing Scrabulous a few months ago. I got hooked and have since bought two sets." Scrabulous has surely been the most innovative of marketing for a board game ever, certainly I know of no better example of using the concept of the Social Object to market a product. This kind of marketing is phenomenal - it cost Hasbro nothing and was driven by fans who have no other motivation other than passion for the game. No-one is making a bean out of Scrabulous (it's a free game) except Hasbro who are selling more more Scrabble board games as a result of Scrabulous introducing the game to a new online generation. Hasbro are grade "A" idiots, compounded by the fact that, with their marketing millions, they really should have thought of it first. 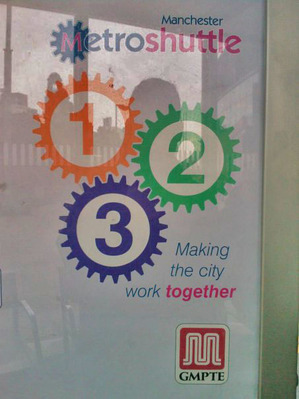 I'm bemused by a "Tube Card" advert currently decorating London Underground trains. 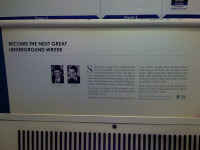 The ad proclaims that "a new Underground movement is starting under the streets of London right now. One that will challenge the established thinking of glib headlines or huge phone numbers." At least that what is says if you stand six inches away from it (on a moving train?!) and have perfect vision. The ad, suggesting that the reader could become the Next Great Underground Writer is illustrated by two postage-stamp-sized pictures of - wait a minute until I get out my binoculars, no that doesn't work because the train's shaking too much, I'll go up close and get out my magnifying glass, oh it's William S. Burroughs ("Underground" - geddit?!) and, nope I can't read that other guy's name at all, but he looks a bit like Andy Garcia. First of all, to compare any kind of advertising copy to the literary works of the opiate-addicted beat writer William S. Burroughs is both both bizarre and extraordinarily arrogant. Secondly, re the mocking of "glib headlines and huge phone number" - you know something guys, at least I can read those headlines and phone numbers. I'm not saying they're great adverts, but glass houses and all that. Yes, I get that making Tube Cards is probably considered the job of least stature in ad agencies, which explains why they're generally uninspired and full of typos (my wife's an editor, don't even ask me about her apostrophe adventures with a red marker pen). However this ad by CBS Outdoor with its big white spaces and miniscule text is the clearest example I've ever seen of an advertiser not understanding the medium. 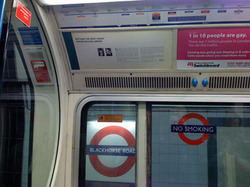 In the case of a Tube Card, you've got to be able to read it from the seat opposite - a good six to eight feet away. As opposed to inspiring me, the ad reminded me of those deliberately bad Advertising Standards Authority posters which ended with the caption "We're here to make advertising better, not to make better advertising. Sorry." Frankly, it's just a pretentious advert made by an agency who think they're above writing Tube Cards.